*Tap tap* Is this thing on? The week I was away in Georgia confirmed my suspicions: I'm not a great traveler and I love being home. I'm so ready to hibernate/cocoon myself in my sewing room to work on projects! I really missed blogging and connecting with you on the internet, too, so here I am. Charity quilts line one of the hallways at QuiltCon 2017. This is just a small portion of them! Since I attended QuiltCon in 2015, I felt a little more prepared for this year. The sheer number of quilts, vendors, and people is enough to boggle your mind. If you're even half introverted, like I am, it takes all the energy out of you (it's amazing, but amazingly tiring, too). The main reason I wanted to go this year was to connect with friends from all over the world, who I usually keep in touch with online. 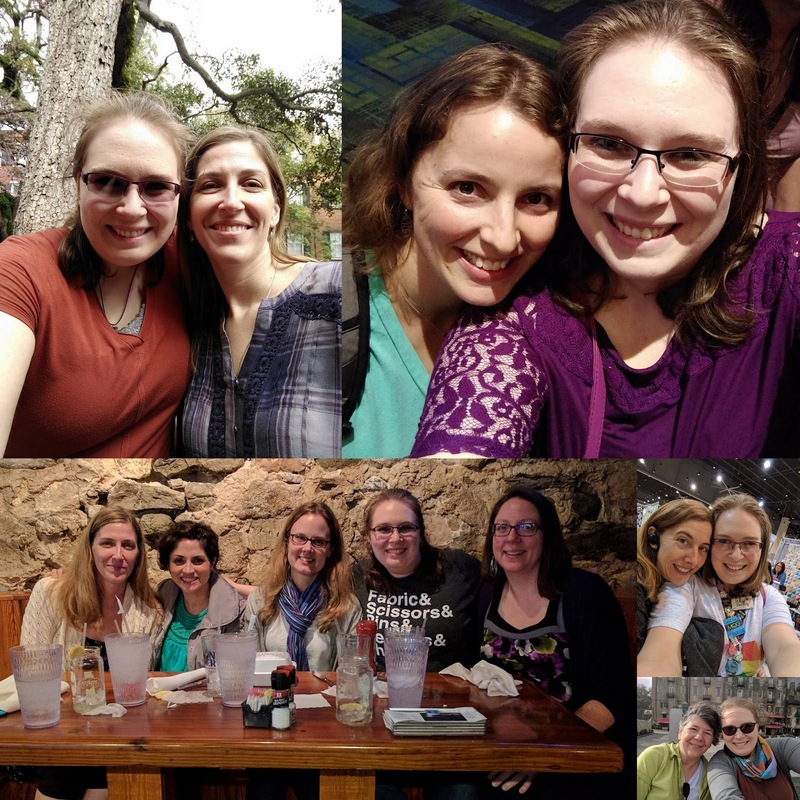 Clockwise from top left: me with Jessica @jtlevitt, Renee @quiltsnfeathers, Yvonne @quiltingjetgirl, Lori @gratitudequilts, Sarah @sarahmgoer, Michelle @frombolttobeauty, Kim @lelandavestudios, and Jess again. There were lots of quilters I had the pleasure of meeting for the first time. The internet is a funny place; there are people I talk to on a weekly (sometimes almost daily) basis, and have never actually met! This includes Michelle @frombolttobeauty, Sarah @sarahmgoer, and Abby @abbyglassenberg. It was so exciting to meet so many Quilty Habit and Wonky Press readers, too! :) Every single meeting was a bright spot in my day. Thank you for coming up and introducing yourselves! Michelle and I have been in contact over our blogs and email for maybe 5 years, and we've never met until now! We had a lovely lunch together and she made me a purple pouch. :D This picture was taken in front of her nine patch challenge quilt, which hung in the show (she wrote more about it on her blog). It was fun to explore Savannah with my Central Jersey MQG friends (over 15 of us went) and enjoy 80 degree, sunny weather after months of New Jersey gray. 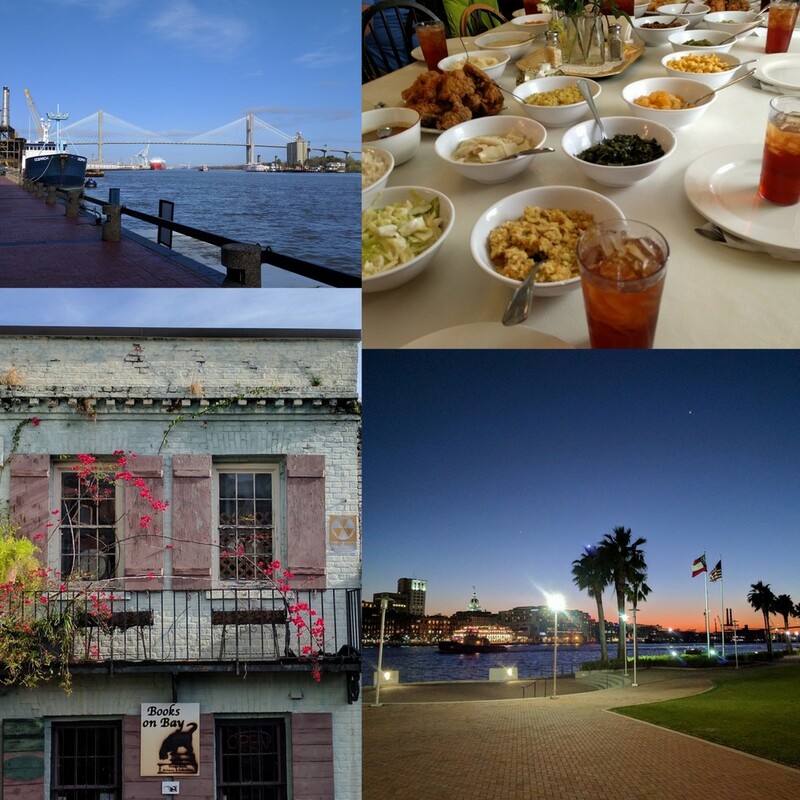 I attended a lovely dinner at The Olde Pink House (a Savannah must) with the guild, and visited again several days later to lunch with more friends. We explored parts of the city, including River Street (next to the river, where there are lots of large barges going by and praline samples to eat), the cutest, most cat-filled bookshop and tea store you ever did see, and SCAD (Savannah College of Art and Design). 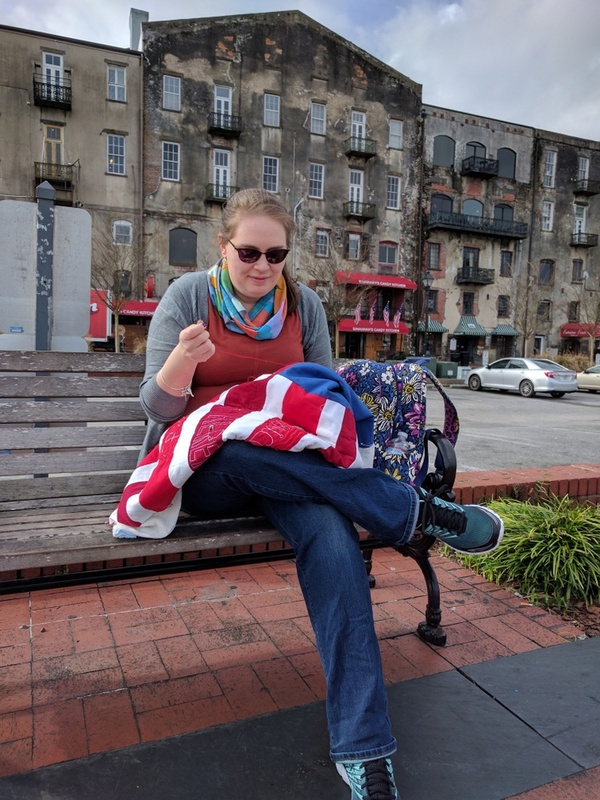 Just being Betsy Ross on the streets of Savannah. More about this project soon; it kept me sane while away from home! "Infinity Lines" by Chiharu Shiota - an entire room strung with red yarn - a current exhibit. This was inspiring and eerie all at the same time, and it got me thinking about how other colors would feel in this space (purple?). 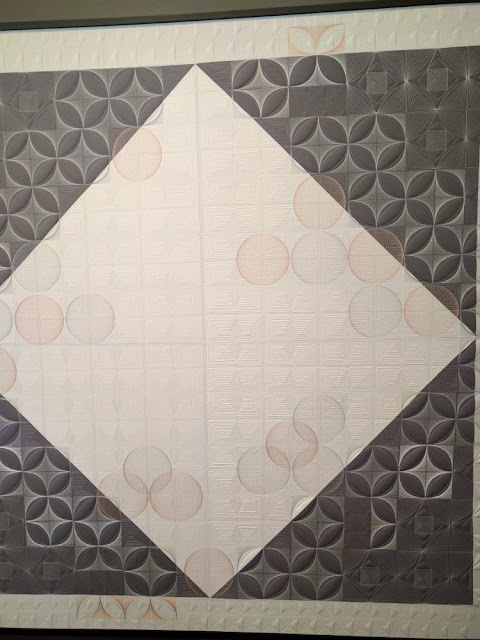 This quilt, "Full Circle," was part of Pamela Wiley's exhibit at SCAD. It was so fortuitous to be in Savannah before it closed. I've been following her beautiful, dense quilting for several months now; check her out on Instagram @wiley_pamela. On this trip south, I also spent ample time in Atlanta with my sister. I have to admit, though; Savannah as a city was more unpredictable and more charming. 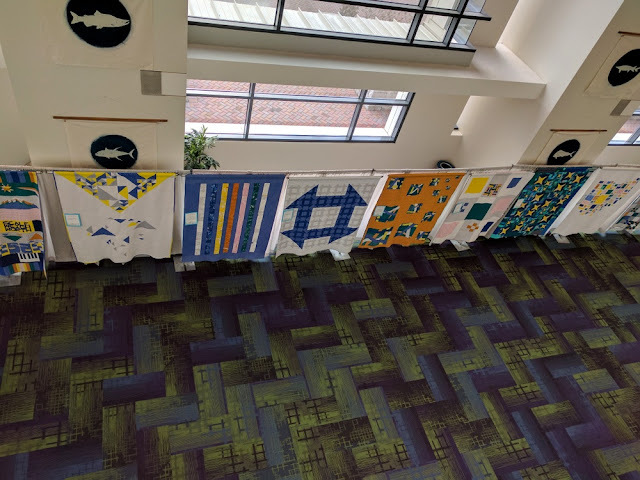 There are 2 more recap posts coming: about the lectures I had the fortune to attend, and the quilt show itself. I'm actually doing some sewing this week, so I'm off. Less online, more sewing! Great post!! 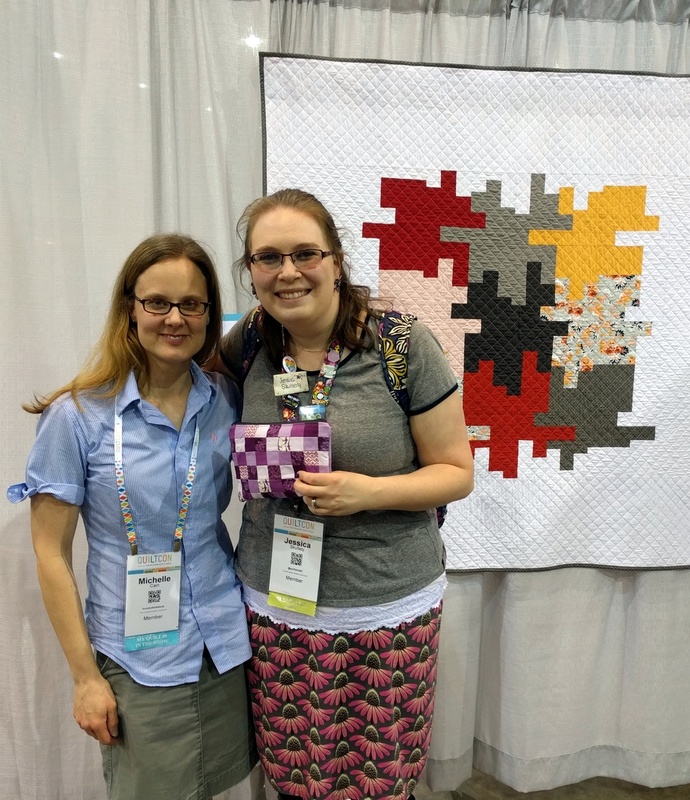 I am sorry that our paths did not cross at QuiltCon, I would have loved to have met you! Quilters are very special people and I love the connection that this craft gives us! I'm glad I managed to say hello to you and I found your comments about the whole other world of modern quilts ( i.e. the ones not at the show ) very thought provoking. Even though I was there the whole time, I fell like there waas so much I missed! So glad we finally met! Great QuiltCon recap! It looks like you had a blast. I'm looking forward to reading more in the series. Thanks, Jess, from the bleachers. Love getting glimpses of QuiltCon and beyond--Savannah has a lot to offer, apparently. Still, I completely understand about the introvert's life and the draw of home. Glad you'll have time to rest and renew. Jess -- it was great to meet up with you as well even for a brief moment. You're way taller than I imagined!!!! 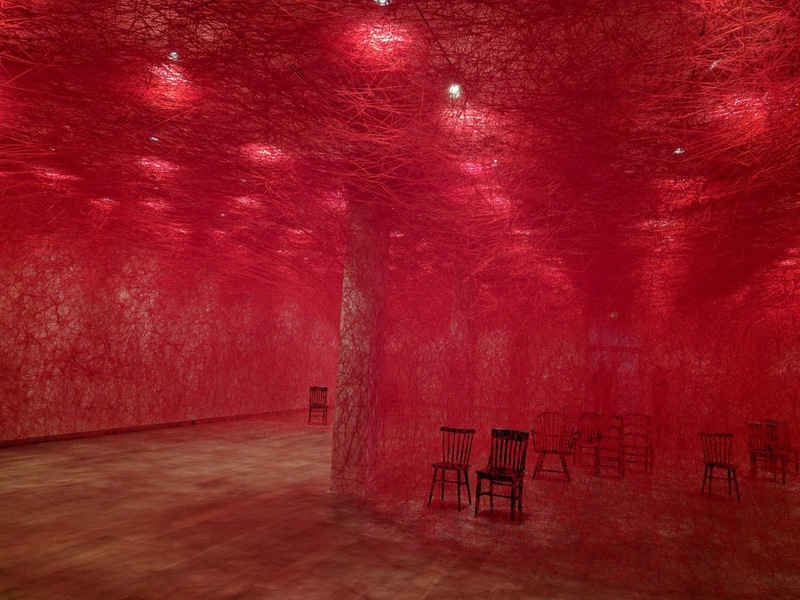 WOW - I wish I had of known about the tour at SCAD - that red room looks amazing!!!! Oh for sure the people were the highlight of the trip! I'm so glad we got to hang out! It was so awesome getting to meet you and hang out! I still haven't gotten caught up from Savannah but have been meaning to stop by to say how wonderful it was to finally meet you, even if it was for only 2 minutes!